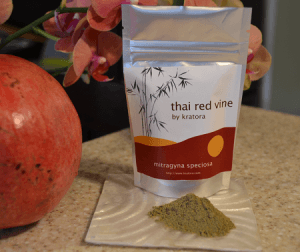 Red Vein Thai Kratom (also known simply as Red Thai) is one of the many options for red vein strains of Kratom leaves and powder marketed today. This variety is said to be highly relaxing with positive effects on mood and emotional well-being. It is not as energizing as some of the green vein products, but the effects tend to last longer and it produces more of a euphoric, pain relieving effect. While some stores do sell Green Thai Kratom, the majority of Thai Kratom sold today is of a red strain origin. Products that bear the Thai Red Vein name do not necessarily come from Thailand where it is illegal to cultivate and sell Mitragyna Speciosa. Many of these herbs are grown from trees that have been imported to Indonesia, particularly on the island of Borneo. 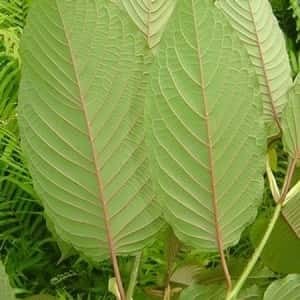 It is important to remember that not all versions of Red Vein Thai Kratom will be the same, but they all should come from a red vein tree if you are purchasing from a reputable supplier. Red Vein Kratom products all share one common characteristic: they come from trees that have leaves with reddish stems and veins. The color of the stringy central vein is determined by the presence of different chemicals in the tree. Some of these differences may be genetic and based on the species of tree that the leaves are taken from. Several Kratom farmers have states that red veined plants are more resilient and have a higher yield in Southeast Asian climates. However, there are also reports that different colored veins occur in the same tree at different stages in the lifecycle. The red veining may be more common in younger trees that are more vulnerable to attack from insects. Another theory states that the different vein colors emerge throughout the year depending on external conditions like temperature and weather. Among Red Vein products, the Thai strain happens to be one of the best-selling, perhaps second only to Bail Red Vein. Red Vein Thai Kratom differs from Bali Kratom in a few respects. In general, Red Vein Bali is said to have a more potent sedative effect while Red Thai may be more stimulating, especially at low doses. The Thai versions are also observed to last longer than Bali strains and are slightly less powerful when used as analgesics to counteract pain. Both make for effective opiate alternatives and can be used as sleep aids or to alleviate depression and anxiety. Red Vein Thai Kratom is particularly seen as having a low risk of side effects and being less likely to result in nausea. You can purchase Thai Red Vein powders, crushed leaves or capsules online from a number of different retailers. In most cases, Thai Kratom is slightly more expensive than those products sold under the Bali name, but the difference only amounts to a couple of dollars per ounce. Bulk powder will cost you as little as $18 per ounce. Whenever purchasing Kratom online, always read reviews from other users who have purchased the same strain as you. This is the best way to determine whether you are getting a real product that lives up to its name. The recommended dosage for Red Vein Thai Kratom is anywhere between 2 to 8 grams per day. At the lower end of this dosing spectrum, Kratom can increase your levels of mental energy, motivation, drive and alertness. In this respect, Red Thai can be compared loosely to coffee, although the energy that Kratom provides is said to be longer lasting and smoother than caffeine. This stimulation can give you better stamina when taking on demanding work, but in rare cases users find that it can lead to restlessness and anxiety. If you experience these negative effects, try switching to a smaller dose or mixing up different strains. For the most part, Thai Kratom is described as having a calming effect and it can actually take the edge off from more stimulating strains such as Green Thai. If you are taking Kratom to help you overcome anxiety, depression, stress or other mood disorders, a dosage of between 4 – 8 grams will give you the best results. At this dosage level, Thai Red Vein is more sedating and contributes to a sense of comfort and tranquility. Around 4 grams, Red Thai is said to be highly uplifting and may be perceived as causing euphoric feelings. When taking 8 grams or more of Red Vein Thai Kratom, it becomes a potent pain reliever, binding directly to opiate receptors in the brain. These larger doses should ideally be used only for a short period of time and you should cycle between different strains to keep your body constantly adjusting. Give Thai Red Vein a try if you want to improve your mood and get to sleep easier with a safe and inexpensive Kratom strain.